The stainless steel Mora Companion Fixed Blade Outdoor Knife is one of our favourite knives of all time. It is no heavy duty war horse of a knife but a great companion when you are out in the wild. It sports a stainless steel blade so you don’t have to worry about rust like on a carbon blade knife. So why do we like it so much. No rust to worry about so bring it fishing or use it out in the rain without too much concern. Treat it with respect. It is a smallish knife but the blade will easily shave the hair off your leg without any difficulty. Use it for skinning game or some wild fishing. 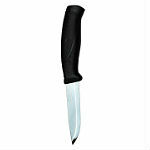 Great knife for carving fine bushcraft tools because it is so easy to handle. The grip is plenty grippy and the blade itself is strong and very durable. 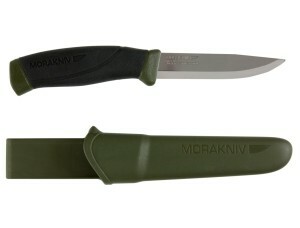 From a design perspective the Mora has a short straight blade, straight point with a small dip towards the point of the knife. Made from high-quality Sandvik steel it contains super fine carbides that make this a super strong blade that will not rust once looked after. The ergonomically designed handle has a textured finish that gives you plenty of grip when using it.